UDM Downloads > ImTOO DVD Ripper Platinum! ImTOO DVD Ripper Platinum is multifunctional but easy-to-use DVD ripping software capable of ripping DVD to almost all video and audio formats, including MPEG-4, AVI, DivX, XviD, RM, FLV, SWF, MOV, 3GP, WMV, WMA, MP3, AAC, AC3, M4A, WAV etc. It can rip DVD audio and video to iPod, iPhone, PSP, Apple TV etc. ImTOO DVD Ripper Platinum enables you to convert DVD to any format they supported easily. You would choose any chapter or clip any segment to get custom DVD audio and video optionally. Profile and output file size customization is also supported. New features: 1.Support multi-core processor. 2.Support 5.1 channel surround sound system. 3.Add new profiles, and profile icon is added in the profile. Key features: 1. Convert DVD movie to most popular video formats, e.g. AVI, WMV, DivX, MPEG-4, RM, MOV, XviD, 3GP, FLV, SWF; 2. Rip DVD audio files to MP3, WMA, WAV, M4A, AAC, AC3 etc. ; 3. Clip any segment you want to rip from DVD, and merge several segments into one if necessary; 4. Split source files into several by file size or time, or merge several sources into one; 5. Rip DVD to multiple different formats at one time for multiple needs; 6. 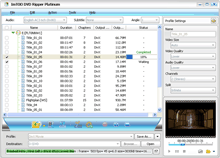 There are detailed audio and video settings provided in ImTOO DVD Ripper Platinum, for example, quality, sample rate, channel and split mode etc. ; 7. Create and edit custom profile optionally in the way of choosing a profile, adjusting its parameters and renaming; 8. Customize the size of output audio and video file for different devices; 9. Support both NTSC and PAL DVD ripping; 10. Preview the source DVD for the convenience of choosing the segments to rip; 11. Retrieve DVD information from the Internet automatically or manually; 12. The excellent quality of audio and video output is beyond imagination. ImTOO Software Studio is one of the pioneers in DVD, video and audio software development.We endeavor to develop most easy-to-use, steady and detail-focused software products.